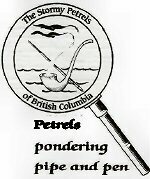 The next scheduled meeting of the Stormy Petrels of BC will take place at the usual meeting location, 7:00 pm, Tuesday, May 5th. The case for discussion will be “The Illustrious Client”. For further information, a list of the discussion questions, or background notes to the story, please contact your Petrel President, or send her a note at the Stormy Petrels’ e-mail address.